NASA has delayed the last flight of the space shuttleEndeavour from July to November at the earliest to allow time to modify itscargo - a $1.5 billion science experiment - for a longer stay on theInternational Space Station. Endeavour was initially targeted for a July 29 launch with acrew of six astronauts in order to deliver the Alpha Magnetic Spectrometer tothe space station. The spectrometer will be installed on the exterior of thespace station to study high-energy cosmic rays in the hunt for elusiveantimatter and dark matter. More than 200 researchers from 16 countries are working tobuild the Alpha Magnetic Spectrometer. The project is led by Nobel laureatephysicist Samuel Ting of MIT. The researchers opted to replace a key part of thespectrometer ? a strong superconducting magnet designed to last for severalyears until the cryogenic supply of liquid helium needed to keep it cool runsout? with a permanent, longer-lasting magnet. 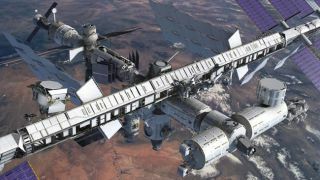 The decision came after PresidentBarack Obama announced in early February his intention to extend the InternationalSpace Station through at least 2020, instead of shutting it down around2015. "Given that the [space station] has been extended, thepermanent magnet gives them a much longer science mission than thecryo-magnet," said Mike Moses, NASA's director of shuttle integration, lastweek. "From a thermal challenge standpoint, I think they'll get a lotbetter science out of this other magnet." The spectrometer's new magnet has actually flown before,during NASA's 1998 STS-91 spaceflight, mission scientists said. The AlphaMagnetic Spectrometer is a 15,000-pound experimentthat uses a powerful magnet to bend the path of incoming cosmic rays so thattheir component particles can be analyzed by detectors to see if they are protons, electrons, and even anti-electrons (calledpositrons) that might signal the existence of dark matter. NASA initially canceled the shuttle mission carrying theAlpha Magnetic Spectrometer to the space station in the wake of the 2003Columbia shuttle disaster. But Congress later approved funding for an extrashuttle mission dedicated to delivering the powerful spectrometer to thestation. Top space shuttle program managers met Friday and decided todelay Endeavour's final mission to mid-November, NASA spokesperson Kyle Herringtold SPACE.com Monday. "They basically made that decision to change theirmagnet and it became pretty clear that they were not going to be able tosupport an end-of-July launch," Herring said. The move now makes Endeavour's STS-134 mission NASA's finalspace shuttle flight after nearly 30 years of orbiter flights since April1981. NASA's nextshuttle mission to fly will be Atlantis, which is slated to launch towardthe space station May 14 carrying a new Russian science module for the nearlycomplete orbiting laboratory. That mission, STS-132, is the last flight ofAtlantis. Endeavour's STS-134 flight was slated to be next in lateJuly, followed by the final launch of Discovery ? NASA's oldest space shuttle ?on Sept. 16. Herring said that plans for Atlantis' May launch are stillon track. Discovery's later STS-133 mission is also still targeted to lift offon Sept. 16, but potential delays associated with some spare station parts andthe refit of an old cargo module to serve as a permanent closet on the spacestation could push that mission back as well. And there are other challenges to launching the AlphaMagnetic Spectrometer aboard Endeavour in November. During much of that month, the space station will be flyingin a so-called beta-angle cutout period in which unfavorable sun angles make itundesirable to send a shuttle to the orbiting laboratory because of power andheating concerns. There is also a new crew launching toward the space stationaboard a Russian Soyuz rocket in the late fall, and the European Space Agencyplans to launch its second unmanned cargo ship to the orbiting laboratoryaround December. NASA also prefers not to fly space shuttle missions overChristmas and the New Year, adding yet another wrinkle if Endeavour cannot liftoff in November. NASA has been promised an extra $600 million in funding ifits three remaining shuttle missions are delayed beyond September. That fundingruns through December 2010. Moses said that he is still confident that, despite thedelay to Endeavour's final flight, NASA will be able to complete its last threeshuttle flights by December at the latest. "We're still looking to finish out this calendar yearat the end of 2010," Moses said. WhatWill NASA Do With the Retired Space Shuttles?